WMR Defense cares about the well-being of their employees in all areas of their lives. WMR is connected with a wide variety of institutions and resources that benefit the physical, mental, financial, social, and community involvement aspects of their lives. All employees have twenty-four hour access to a board-certified doctor through LiveHealth Online using their smartphone, tablet, or computer. WMR also partially reimburses employees that have an active gym membership. 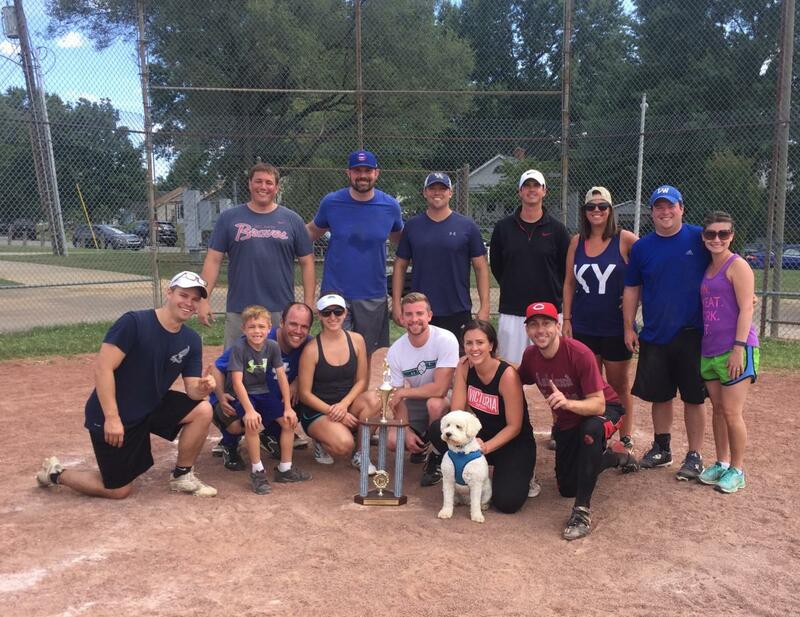 Additionally, WMR offers weekly onsite yoga classes and enter a team in the Lexington Lawyers Softball League each year allowing employees an outlet to take care of their physical health while also getting to know their colleagues in a different light. These tools empower employees to take charge of their physical health by creating convenient access to doctor’s visits and workouts. "Congratulations to WMR on completing a perfect, undefeated season after winning the post-season tournament on Saturday. WMR defeated Commonwealth Attorneys 9-4 in the first round, knocked out Dinsmore 14-1 in the semis, and then closed out the tournament with a 17-4 win over the upset-minded, but surely exhausted, Fed Sox. After clinching a second consecutive league championship, WMR posed for a victory photo with the league trophy and some well-deserved smiltes (see attached). Congrats, WMR!" WMR regards mental health very highly as well. LiveHealth Online is dually useful in this respect, as employees can also use it to make an appointment and see a therapist from the comfort of their own homes. WMR provides contact info for Kentucky Lawyer assistance Program (KYLAP) to new employees upon hire. In addition to helping with mental health, KYLAP assists with psychiatric visit costs, mental problems, depression, drug abuse, addiction, and more. As member of DRI, WMR attorneys can take advantage of the many mental health and crisis assistance programs that it provides. Specifically, the DRI for Life Committee allows employees to connect with various groups and programs based on their own needs. WMR ensures that its employees feel secure financially through its access to benefits, educational programs, discounts, and more. WMR coordinates numerous supplemental benefits and brings representatives onsite to offer many educational seminars on financial planning and management while also providing handouts for employees on the same. Through such educational programs, WMR’s employees are equipped with the necessary tools to manage their own finances confidently. Full time employees get the added benefit of having a life insurance policy, purchased by WMR. Employees can get a discount from certain vendors for personal use. Lastly, employees have access to a financial planner who can assist with financial planning and life insurance. WMR’s connections with many different financial institutions work to the benefit of its employees’ financial heath both in the present and the future. WMR has many traditions that allow its employees to engage in a vibrant social life alongside their coworkers. Every summer, WMR host a picnic for employees and their immediate families. During the holiday season, WMR employees enjoy a potluck lunch and gift exchange for those that wish to participate, as well as a decorating contest. WMR also celebrates birthdays once every month and host happy hours for associates a few times a year. Every other Thursday, associates take turns hosting snack time in the afternoon. Our employees’ engagement with each other outside of the work sphere creates a sincere social environment. At WMR, giving back to the community is twofold. WMR organizes volunteer opportunities for employees every year. In the past, volunteer opportunities benefited Habitat for Humanity and the Hope Center. Employees have made donations to God’s Pantry which WMR has matched during the Thanksgiving season. In addition to encouraging employee volunteer participation, WMR welcomes young minds through the city’s Summer Youth Job Training Program. This program employs high school students during the summer, allowing them the opportunity to gain experience develop interpersonal skills and learn and explore vocational interest while earning income during the summer. WMR also collects Box Tops from employees to donate to local schools. WMR is actively engaged with multiple organizations that allow its employees to go out and volunteer as well as invite youth to experience the legal profession in our very own firm.